At one time or another, all children will limp for a while. Limping means a child can't walk normally but can still hobble around. If your child refuses to walk or put any weight on a leg, this is not limping. You should immediately take them to see their GP or to the Emergency Department. Usually limping happens because of a minor injury, and will get better by itself. However, if your child's limp lasts for longer than three days, it's important to take them to see their GP or nurse practitioner, to find out what's causing it. If they have a limp and have a fever or are in pain, you should take them to see their GP as soon as possible. What are the most common causes of limping in children? The two most common causes of limping are minor injuries and irritable hip (transient synovitis). 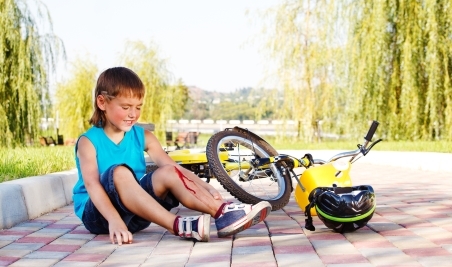 Injuries in children are usually obvious, but if your child continues to limp for more than three days after an injury, they may have a broken bone (fracture). Take them to their GP to get checked. There are several things you and your child can do to help them get better after a minor injury. Your child may need simple pain relief. Make sure they take it regularly until they are comfortable, but never give them more than the recommended dose for their weight. For the first 24 to 48 hours after they start limping, apply ice to the painful area every two to four hours, for 20 minutes at a time. This helps to ease the pain and reduce any swelling. Wrap the ice in a damp towel or cloth – don't apply it directly to your child's skin or you could cause an ice burn. Encourage your child to rest and avoid doing anything that makes the limp worse. Irritable hip (transient synovitis) is also a common cause of limp in children. This can cause pain in a child's hip, groin, thigh or knee, usually on one side only. Irritable hip is caused by inflammation of the hip joint. We don't know exactly what causes the inflammation, but your child may have recently been unwell with a viral infection (virus), which causes inflammation. This isn't a serious condition, and usually gets better by itself. However, you should take your child to see their GP, to check they don't have something more serious, like a bacterial joint infection. What else can cause limping in children? Other causes of limping aren't common, but they can be very serious if not treated promptly. Perthes disease, Slipped upper femoral epiphysis (SUFE), and tumours are less common causes of limping, but they can be serious. How do I find out what's causing my child's limp? It can be hard to diagnose what's causing a child's limp, as the pain could be coming from several different places – their foot, leg, hip, or back. Also, children often can't describe where or how it hurts, and sometimes will continue playing even though they're in pain. That's why it's important to take your child to see a GP or nurse practitioner if they have a limp that's not going away. The GP or nurse practitioner will ask you questions about your child's limp, any other medical issues they have, what they've been doing recently, and overall health. They will also ask if there are any joint conditions in your family, and they will examine your child. Your child may need some tests, such as X-rays or blood tests, to find out what's causing their limp. Your child's GP may refer them to see an orthopaedic (bone) surgeon or a paediatrician (a doctor who specialises in treating children), but most children don't need this. How are limps in children treated? Treatment depends on what's causing your child's limp. Generally, children heal very well and often they will get better on their own, without any further treatment. Your child's GP or nurse practitioner will talk with you about any treatment they may need. When should I seek further treatment for my child? they get tingling or a change in feeling in their legs or feet. Written by HealthInfo clinical advisers. Endorsed by orthopaedic surgeon, Canterbury DHB. Page created November 2017.